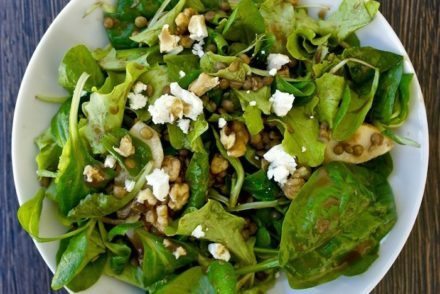 In Greek cuisine it is a common practice to combine beans with other ingredients such as greens, meat, rice and even fish. 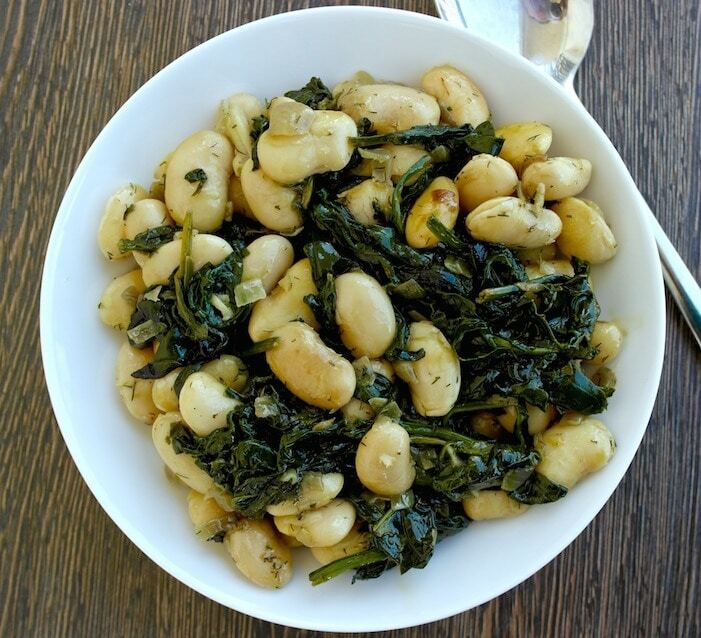 The famous “gigantes” beans that are usually cooked with tomato cooked and this version is more of a wintery recipe combining these white beans with spinach. The word gigantes means the giant ones, and they are a popular bean here in Greece. Gigantes from several areas of Greece have a Protected Geographical Indication status due to the unique environment that these beans are grown in. If you find them – use them, otherwise you can use butter beans or even smaller white beans. 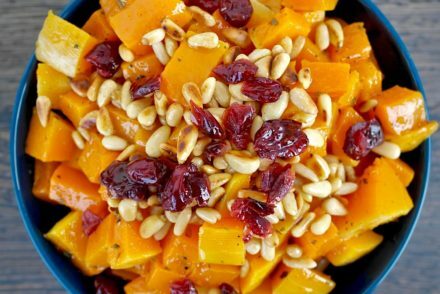 Obviously this dish is bursting with nutrients; antioxidants, fiber, good fats. But have no fear, as with all Greek dishes, they have made it an art of making vegetables and beans delicious. You may serve this as a side dish or as a sharing appetizer, but the best is to serve it as a main dish. You’ll fulfill a large percentage of your daily requirement in vegetables and beans. For those eating cheese, you can serve it with feta and some bread, otherwise it is equally good without cheese. Rinse the beans and simmer in water until soft but not falling apart, for about an hour (may take less-check after 30 minutes). Remove from water and rinse. In a pan, heat 1 tablespoon of olive oil and sauté the onion and the spring onion for about 5 minutes. Then add the garlic and sauté for a few seconds until it releases its aroma. Add the spinach and heat until wilted. Mix the spinach mixture with the beans gently. Add the dill and 2 tablespoons olive oil and blend. Place into an ovenproof dish, add salt and pepper as needed. Remove from oven, drizzle with another tablespoon olive oil. You can serve with a squeeze of lemon. This looks delicious! My family loves gigante beans. They are incredibly meaty and they have an amazing texture . They cook up so much faster than any other dry beans, which is surprising since they are so huge. I’ve only had the preparation involving tomato. It is one of my favorite bean recipes for summer, when vine ripened tomatoes are available. I will try this recipe, as soon as I can get my hands on a bag of beans. They are hard to find in the US and expensive. Thanks Christine! You can use butter beans or just plain white beans too. Elena, I just made this and am so pleased with the dish! My dad was Greek and I grew up and still enjoy Mediterranean and Middle Eastern cooking. 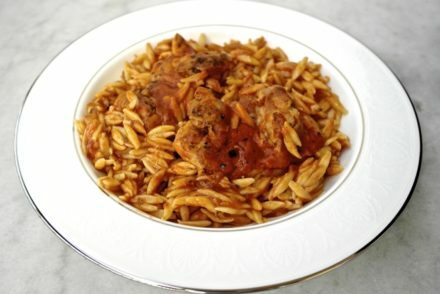 I used canned Goya Giant Beans ( available in US) which I rinsed before adding. I also added finely chopped celery and carrots and a tablespoon of tomato paste to the onions and garlic in the pan before adding the spinach. I use low sodium chicken or veggie soup mix, wine and water to cook/steam the veggies so I can cut back on the oil. I used curly spinach which I hand chopped. I love the fresh dill and lemon in this dish. I transferred the beans and spinach to a covered ovenproof dish and baked at 300F for 90 minutes. Took the cover off immediately out of the oven and let the extra liquid evaporate and thicken the dish. Just wonderful – love your site! Thank you for input Roxanne. Although I wouldn’t try to cut down on the olive oil, the presence of olive oil apart from contributing to the palatability is also one of the reasons that this diet is healthy. Actually, research shows that oil (olive, avocado, coconut, and others) are inflammatory contrary to what we are taught. Research shows that extra virgin olive oil has anti-inflammatory effects due to the antioxidants it contains. Remember olives are a fruit. I have made this twice now and it is so delicious! The added crunch from baking the beans in the oven is divine – it is such a nice texture contrast with the spinach. Both times I’ve made this I’ve used dried great northern beans, just because of the ease of availability in my area. Thanks for such a tasty and simple meal! I made the recipe, for New Years Day, using black-eyed peas since that is the Southern tradition for New Years. It tasted great and was much healthier than the standard Southern Flare! Elena, I have some tomato sauce I put up myself, and will definitely add bitter greens to the dish. A supermarket chain sells bags of “leafy greens” (kale, spinach and collards, flash frozen) and I stock up on them when they are on sale. 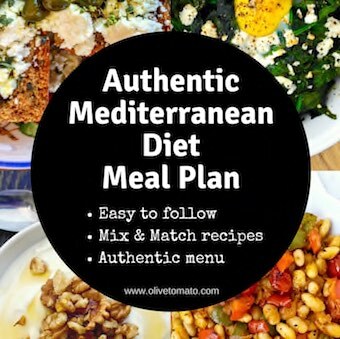 I had digestive problems with beans recently, but hope that it is just a one-off..
Mediterranean Diet May Improve Mood – Here is What You Need to Eat.